The DTM Newsletter is a weekly newsletter that I publish every Wednesday. It features essays and news updates from yours truly, including the latest events on our book publishing empire. We continue to add new subscribers every week, and if you are among them, you have my thanks. Everyone who subscribes to the newsletter receives a free ebook. Previously, that free gift has been the 42-page zine Bocanada. 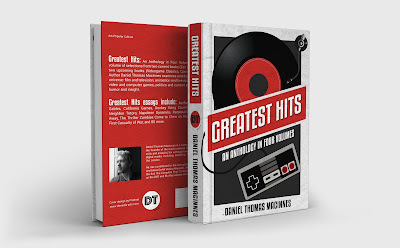 However, now that my KDP Select contract has ended, I can offer you one of my full-length books instead, Greatest Hits: An Anthology in Four Volumes. Greatest Hits is an anthology of essays and stories taken from four other books, hence the title. Two of the books are now available, Pop Life and Zen Arcade: Classic Video Game Reviews. The two remaining book titles are still in production. It was an interesting experiment that I wanted to try out, and to be completely honest, it was my original intention to make this the "free book" for the mailing list. I just got greedy at the last minute and put all three titles up for sale. Now Greatest Hits is back where it properly belongs, as a free anthology for all the new subscribers. As for the existing ebook titles on Amazon, I will soon be publishing on Apple, Barnes & Noble and Kobo as well, and I will run a "free" promotion for a while. For Studio Ghibli fans, Greatest Hits includes 26 essays that belong to the "Conversations on Ghibli" book project. One longer essay about the 1984 Nemo movie project was written specifically for the project and has never been published on Ghibli Blog. I always liked the Greatest Hits book. This is a great book. There's so many entertaining essays on movies, music, videogames and life. It's got the best cover design of my three titles, and looks great in paperback.